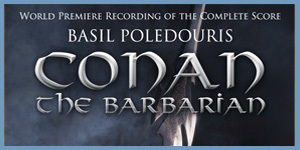 I’m kinda stoked about this – it looks like a special 2CD edition of Basil Poledouris‘ score to the film Conan the Barbarian has been recorded for Prometheus Records by James Fitzpatrick. The original score was infamous for having scored 24 French Horns (yes, 24 French Horns) for the opening number of the score, Anvil of Crom. Born in Kansas City, Missouri, Basil Poledouris credited two influences with guiding him towards music: the first was composer Miklós Rózsa, the second was his Greek Orthodox heritage. Poledouris was raised in the Church, and he used to sit in services enthralled with the choir’s sound. At the age of seven, Poledouris began piano lessons, and after high school graduation, he enrolled at the University of Southern California to study both filmmaking and music. Several short films to which he contributed are still kept in the university’s archives. I can definitely hear the Miklós Rózsa influence, but had never thought about the Greek Orthodox background. After re-listening to some of the numbers from the score (and now that I have some understanding of musical traditions associated with the Eastern Church) I can hear that now too.